Swedish Massage: Swedish Massage is regarded as the most common form of massage. This is a gentle massage using long connected strokes, kneading, and circular movements, helping the muscles and connective tissues of the body by improving circulation, relaxation, pain relief, overall health maintenance and well-being. Deep-Tissue / Sports Massage: This massage technique uses slower, more forceful strokes to target the deeper layers of muscle and connective tissue. Deep-tissue massage is commonly used to help with muscle damage caused from injuries. Zen Shiatsu: Shiatsu refers to Japanese pressure point therapy using the meridians that run through the body to move and correct the flow of energy. Shiatsu can be used to relieve a variety of issues including back pain, neck pain, shoulder problems, stress, insomnia, digestive issues, and general fatigue. This type of massage (bodywork) therapy is based on traditional Chinese medicine and has been recommended since ancient times. Hot and Cold Stone Massage: Hot stone massage uses smooth, heated stones. The Basalt stones commonly used for massage are created from black volcanic rock. These stones absorb and retain heat for long periods of time. 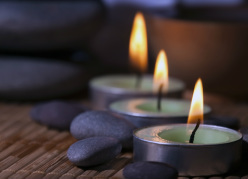 The heat from the stones helps relax tight muscles and increases blood flow to the area. This accelerates the healing process. Cold stone massage provides many benefits as well. It is helpful with treatments to sports injuries, sinus problems, menstrual symptoms, and circulation issues. Marble, jade and onyx stones are commonly used. Many treatments combine hot and cold alternating stones to provide greater benefits. Joint Mobilization: Joint mobilization is a type of bodywork which provides passive movement of the skeletal joints. This technique is normally aimed at a joint or set of joints to achieve a therapeutic effect. ﻿Lymphatic Drainage: ﻿ Manual lymphatic drainage is a type of massage treatment designed to aid in the natural drainage of lymph from the body. Unlike the circulatory system which has the heart as a pump, the lymph system depends on the contraction of the smooth muscles and the movement of skeletal muscles. A wonderful ancient tool has found its place in the contemporary world of health care. ACE Massage Cupping™ is a modern form of vacuum therapy, and the incredible results that this simple treatment produces have truly impressed those who experience its subtle power. 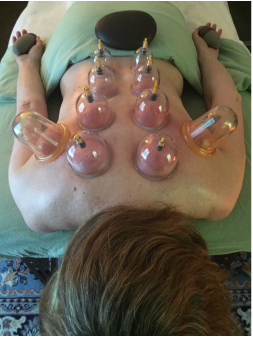 By creating suction and vacuum pressure, ACE Massage Cupping™ is used to soften tight muscles and tone attachments, loosen adhesions and lift connective tissue, bring hydration and blood flow to body tissues, move deep inflammation to the skin surface for release, and drain excess fluids and toxins by opening lymphatic pathways. any means or in any form whatsoever without express written permission from Bluestone Massage & Bodywork, LLC.